3 nil Gers. Defoe a brace and big Lafferty with a 25 yard volley. Another win to get a lovely WWWWW under our name. When was the last time we had that. Seriously? We surely must be right up for this tomorrow . Please just win Rangers ! Katic in for Goldson and Davis for Arfield if they are not fit. Sky reporting that the manager will make changes, and they expect Foderingham and Davis to play. Personally, I would only make the enforced change of Defoe for Morelos unless we have anyone who started at Aberdeen unfit. Im going with 3-1 to Rangers, Defoe to get a brace and then Kent to kill it off! Does the Aberdeen game actually kick off on a sunday at 7.15? I’m buzzing for this match. We owe these pwicks a bloody nose and I’m confident that by tomorrow night we’ll have knocked Kilmarnock out of both cups on their horrible plastic pitch. Come on The Glasgow Rangers. We’re going to destroy Killie tomorrow. 0-4 or 0-5 with at least one red for them. I take it Rtv will have the game on for us viewing outside the UK? 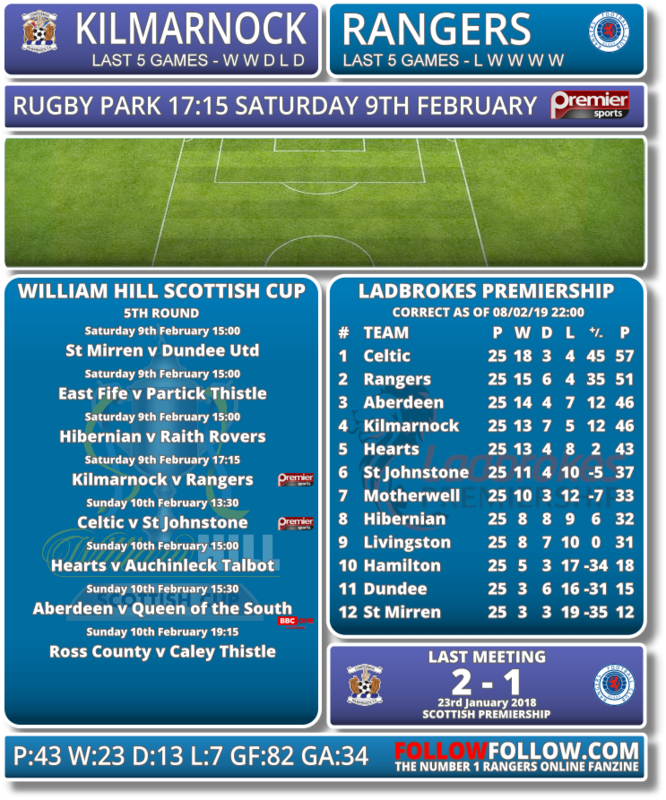 Rangers hopefully will beat Kilmarnock. Someone get the team posted! I hope we give them a doing, it's been too long since we really hammered them. Kirk Broadfoot hopefully sustains a bad injury and Gerrard sticking the nut on Clarke into the bargain. I think we'll win, taking them back to Ibrox would help with the bans on our players though. Not very staunch but honestly, I'd take a draw if offered now and no injuries. Would the replay come before either the St J or Hamilton game? Reduce Alfies ban in effect. The graphic is slightly wrong it's the game under that kicks of at 7:15 but on Monday. Yesterday was all about who won't play, thanks to the SFA appeasing the paranoid tarrier hordes. Today is about who does play, and who will get us a win to take a step towards our first major trophy in 8 years and first Scottish Cup in 10 years. Let's show them we will not be brought down by their cheating, we will not be stopped from getting back to where we belong as Scotland's most successful football club. A win today is what matters, and by God it will be sweet if we do it. No matter who plays, leave nothing out there and do the jersey proud. I’ll be absolutely furious if Gerrard doesn’t play our strongest available 11 today . That means Mcgregor must start . No ifs no buts he’s our best goalkeeper and this cup is our last chance of a trophy . Let’s see what he does . Last chance of a trophy? Hmm where do you even start with this ? Get this mob rattled today please Rangers. Send out a message that despite Scottish footballs best attempts to weaken us and break our resolve, we will not be rolled over. Let’s start with this two bob mob and their booze addled yahoo manager. We're the team that's just smashed Aberdeen and Livi away. They'll drop points in the next few weeks, while we get stronger and stronger. I said we'd win comfortably at Livingston and Pittordrie and we'll win comfortably again today. We're the team in form, not them. Vowed never to buy Premier Sports again. Saw advertisement for Sky subscribers first month free. Signs up and will cancel before a payment is taken. The only reason his first game is today is the you miss the next regardless of the competition for a violent conduct dismissal. The other two will be league games regardless. My belief is with 13 games to go and six points and GD behind the Yahoos , the league is gone . We have a superb chance of lifting the Scottish cup though . Today is huge . I believe we can do it . Understood. Thanks mate. In that case, 2-0 Rangers. Defoe double. My kids tree house has been blown to Fck and smashed to smithereens . Never known wind like it . Don’t fancy playing football in it . Great leveller for killie let’s hope we get the run of the plastic so to speak . I'm glad you're not our manager mate. We've still to play them twice, plus their away form is abysmal. Walked through the town this morning and all the take aways and shite from last night were getting blown around about 4 feet off the ground in a twister fashion. Last statement isn't quite true. We've won our last 4 in all comps, they their last 5. Both teams currently on a good run of form with them just edging it. You did predict the livi and sheep results mind you, and I seriously doubted you after the killie game. Smash these bsstards Rangers and put that prick ckarke back in his box. Hearts gained 6 points over Celtic in the first 5 or 6 games this season. There are 39 points to play for and we still have to play them twice. They are favourites but we most certainly are still right in it and it is insanity to give up on it at the moment. I’m glad I’m not our manager too mate ! And I hope you are right . However to say we are in form and they aren’t is delusional . They have won their last 6 games without conceding a single goal . They haven’t dropped a point at home all season . They have the same away stats as us . I hope we smash these feckers. We'll agree to disagree mate. Their home form has been good all season. It's on their travels they'll slip up. We've just won at Livi and Aberdeen. Really tough game today - they're a decent side. Hoping we can edge it 2-1 - but don't underestimate Kilmarnock. I believe we will have to win every game to win the league.